Do you ever feel like a full time house keeper? You finish cleaning up one mess and another magically appears right behind you. Yup, I’m a mama who paints wall murals with a degree in house cleaning. Like, how many Cheerios are actually in that box, anyway? I feel like there must be a million because I find them in every nook and cranny. And yogourt…don’t even get me started. It’s on the couch. Smeared on the window. In the cat’s fur. So when I made homemade paint for Audrey last month (who is now 10 months old), I mentally prepared myself for the mess that would be. It’s a good sensory activity. It develops her motor skills. BUT sometimes I just don’t feel like cleaning up a load of homemade paint (or pulling out the drop sheets I use when painting my wall murals). I started thinking of my Etch a Sketch from when I was a kid and decided I’d make my very own Etch-a-Sketch inspired Paint Pad using the homemade paint recipe from last month. Since I have some green spinach paint pigment left and it’s St. Patrick’s Day this month, I decided on green! 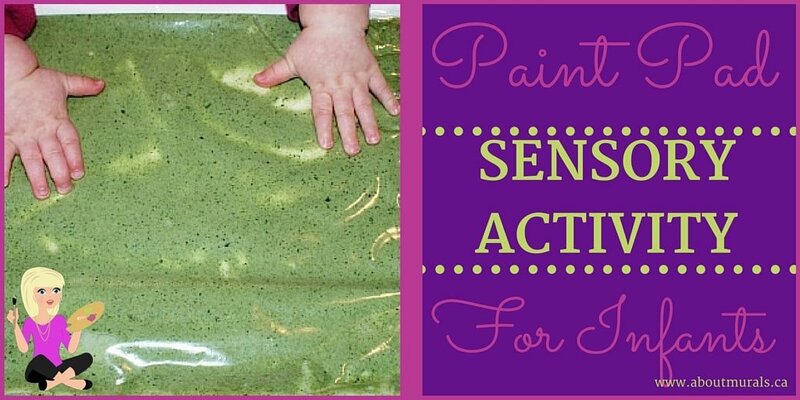 It turns out, Audrey likes this project just as much as actually painting – and both are great sensory activities. So the first step is to make the paint. I made a new batch using the homemade paint recipe from last month. If you’re not up to making it, you can use numerous other ideas. Since there is almost no chance of the paint getting into your baby’s mouth, the sky is the limit in terms of what you use to fill the ziplock bag. You can use tempera paint, shaving cream, toothpaste – whatever! If you want to get extra creative, why not use aloe vera gel and add sparkles? Love the bling! 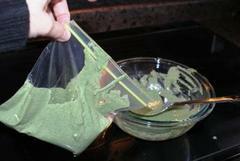 Now that you have the filling, it’s time to stuff your baggie. The trick here is to not overfill the plastic bag (like I did). Eek! You only need about 1/5 of the bag filled – just enough to get some colourful mush in the bag with room for it to move all over. 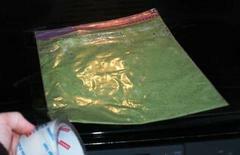 Also, I started with a small sandwich bag but after overfilling this, I tried a large freezer bag. This was way better since it has a large area to “paint” on and it is more sturdy (less chance of the bag piercing and paint coming out). To be extra careful, I taped all the edges of the freezer bag. Audrey’s nails have done some severe damage to my face. I could just picture her tearing into the edges and getting paint everywhere. If you use the homemade paint recipe, it’s no biggie. The last step is to tape it down so the paint pad can’t move. 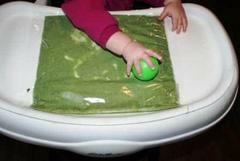 I taped it to Audrey’s high chair, but you could also tape it to cardboard so that you can move it from room to room. 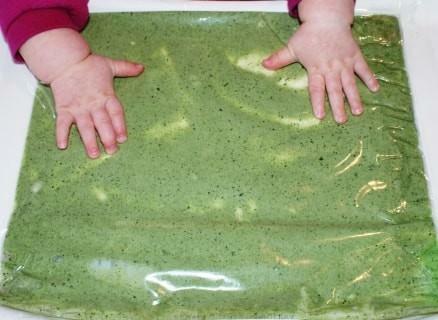 I’ve also read about moms making sensory play mats. They make several bags and tape them all down to cardboard for their infant to play and discover different colours, patterns and textures. After Audrey felt the mooshy paint with her hands and made a few “paint strokes” I gave her a green ball to draw on the paint pad too (a quick version of my Colour Game). She loved it. I’d love to hear if your baby likes the paint pad (and how much you enjoy not having a mess to clean up!). Let me know how it goes in the comments below. **Disclaimer: my games and activities are not scientifically proven, but are routed in my own research, experiences and explorations. Always supervise your baby while having fun with her. Never allow infants or children to play with items small enough that may be a choking hazard. 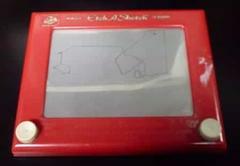 I am in no way affiliated with Etch a Sketch.